There have been few film directors more adept at wringing tension out of a situation than a man born in Leytonstone in the nineteenth century. His career spanned the Atlantic, and more than fifty films across six decades. Very few directors have names that are synonymous with a particular genre, and even fewer have so perfectly blended the art of pure cinematic storytelling with groundbreaking filmmaking techniques. His films typically embrace themes of death and violence, yet are often laced with gallows humour. Welcome to the deliciously macabre world of Sir Alfred Hitchcock. A slew of Hitchcock’s classic films have recently been released on DVD, in remastered versions that would have made the director swell with pride. Six of these films are part of Universal’s Hitchcock collection (available separately, or as a box set with a bonus disc: the featureless R2 version of Psycho). 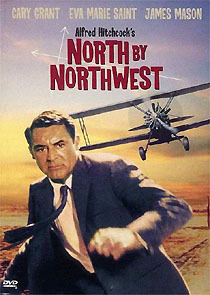 Strangers on a Train and North by Northwest are available from Warner Home Video. Saboteur is typical of Hitchcock’s early films, like The 39 Steps (1935) and Secret Agent (1936), this time telling the story of a munitions worker (Robert Cummings) falsely accused of sabotage. It has some excellent set pieces, including a thrilling finale set atop the Statue of Liberty, but it’s rather creaky, and shot through with wartime propaganda (the film was shot shortly after the attack on Pearl Harbor). The DVD features Saboteur: A Closer Look documentary (35m); theatrical trailer; production sketches (spoiled by an erroneous video transfer), storyboards, posters and stills galleries. A serial killer nicknamed The Merry Widow Murderer (Joseph Cotton, a long way from later trash like Baron Blood) hides from the police with his sister and his niece, who gradually begins to suspect Uncle Charlie’s terrible secret. Hitchcock’s cuckoo-in-the-nest story smoulders perfectly, and is very nicely cast and performed, but it’s a little dated, and the folksy Americana is a little hard to swallow. Cotton’s charming serial killer is one of his best roles: no mean achievement from a stalwart of Orson Welles’ repertory company. The DVD features a 35m documentary, Beyond Doubt: The Making of Hitchcock’s Favourite Film ); re-release trailers; production art, posters and stills galleries. Hitchcock made Rope to appear as if it were shot in one continuous take (in fact, it was shot in ten-minute blocks, and joined as seamlessly as the technology would allow). The film was based on a 1929 play (itself based on the notorious Loeb and Leopold murder case), and it feels like it. The performances of the killers seem dated and overly mannered, but Stewart’s slow-burning detective work and Hitchcock’s tricksy direction make it compelling. The film’s trailer, included here, begins with a scene set in Central Park, effectively acting as a prologue. This was Hitchcock’s first colour movie. The DVD features a documentary, Rope Unleashed (33m); theatrical and re-release trailers; posters and stills gallery. The film, one of Hitchcock’s best, has a brilliant premise and a thrilling script by Raymond Chandler (adapted from the novel by The Talented Mr Ripley author Patricia Highsmith). It also boasts a chilling performance by Robert Walker, whose life was cut criminally short shortly after making the film. The Warner Brothers DVD presents two slightly different versions of the film, one on each side of the disc: the “Hollywood” version, which omits some dialogue introducing a more overt homosexual element, and the UK version, which deletes an amusing epilogue. The UK’s Region 2 disc omits trailers for four other Warner Brothers Hitchcock films, some production notes and an explanation screen for the newsreel footage. It also bizarrely only allows menu access to half of the chapters. The trailers aside, these are minor niggles. Rear Window is a beautifully constructed chamber piece, which brilliantly uses its limitations to create some of the director’s most nerve-wracking scenes. The film was nominated for four Oscars. The DVD features a restored print; a 55m documentary, Rear Window Ethics ; an interview with writer John Michael Hayes (13m); theatrical and re-release trailers; posters and stills gallery. Hitchcock’s pitch black comedy, about the difficulties of permanently disposing of a body, is the director’s quirkiest film, full of interesting characters and boasting a plot that would rival a West End farce. This underrated film is presented in 16:9-enhanced widescreen, making the best of Robert Burks’ beautiful autumnal VistaVision cinematography. This film also marked the director’s first collaboration with composer Bernard Herrmann, who brilliantly scored half a dozen of Hitch’s movies. The DVD features a 33m documentary, The Trouble With Harry Isn’t Over; home movie footage, re-release trailers, posters and a stills gallery. This film, a remake of a film Hitchcock made two decades earlier, is about spies who kidnap a young boy to prevent his parents from revealing what they know about an assassination plot. The creaky 1934 version starred Leslie Banks: the remake is bolstered by James Stewart, but has no-one to match the original’s Peter Lorre among the villains. The remake is also hampered somewhat by Doris Day (who even breaks into song at one point, with the Oscar winning Que Sera, Sera), one of Hitchcock’s least enticing leading ladies. A couple of bravura set pieces thrill, and some of the location filming is exotic (especially on this 16:9-enhanced widescreen transfer), but the film is almost inexplicably mundane. 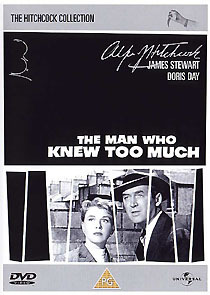 The DVD Features The Making of The Man Who Knew Too Much documentary (34m); theatrical and re-release trailers; posters and stills gallery. Cary Grant takes the lead in this fabulous adventure film, which sees a meek advertising executive framed for murder, and caught between spies and the police, who both think he’s acting for the other side. It’s a classic thriller, and the archetypal Hitchcock movie, (this is, after all, the film with the famous biplane attack, and the climactic chase atop Mount Rushmore!) The new DVD version presents a controversial re-mastering effort, (controversial because the work went into making a pristine video version, rather than restoring the original film elements), and the new 16:9-enhanced widescreen disc, with a new 5.1 sound mix, looks and sounds astonishing. Bernard Herrmann’s score is a masterpiece, and is available here in stereo as an isolated audio track. As with Warner’s Strangers on a Train, the UK disc doesn’t allow menu access to all the chapters. This is the only disc of the releases reviewed here to feature a commentary track, by scriptwriter Ernest Lehman. The DVD features a forty-minute documentary, Destination Hitchcock: The Making of North by Northwest; theatrical and TV trailers; stills gallery; isolated score; commentary track. After their sterling work on the first wave of Alfred Hitchcock films, reviewed above, it is with heavy heart that we report that the second batch has been rather bungled. As before, Universal's second batch of Hitchcock discs are available as a boxed set, which includes the terrific bonus of the anamorphic version of Vertigo, or separately, in more traditional packaging. The second set covers the director’s later work for Universal, from his ambiguous 1962 adaptation of Daphne Du Maurier’s The Birds to his very last film, Family Plot, in 1976. It charts a talent on the wane, but even in diminished form Hitchcock was still a formidable filmmaker. Each disc comes with a new documentary, ranging from half an hour to an hour long, packed with interviews with key cast and crewmembers. Each disc also comes with at least one theatrical trailer, and comes with an illustrated booklet with production notes. Other bonuses include Tippi Hedren’s screen test and newsreel featurettes on The Birds; scenes with an alternate score (by Bernard Herrmann) on Torn Curtain; three alternate endings on Topaz (which has also undergone significant restoration, and is now more than quarter of an hour longer than the version previously released on video, in 1993) and storyboards, on Family Plot. Marnie and Frenzy fans will have to content themselves with the documentaries and production art galleries. The considerable fly in the ointment the second time around was that four of the films are presented in full-frame format, presumably using old transfers. This is particularly irksome, since the clips in the documentaries are generally in their correct ratio, and this makes for easy comparison. Universal has quite a reputation for shoddy quality control, or just not grasping what DVD buyers want (witness a slew of full frame releases). The shortcomings of the UK transfers of Topaz, Torn Curtain, Marnie and The Birds may be acceptable to less discriminating customers, but stalwart Hitch fans will probably want to opt for the American versions, which contain more or less the same supplements, and have the films in their intended ratios. All of Universal's discs lack the production notes of their American counterparts, but this is a very minor quibble, easily rectified by the purchase of any decent book on the director. (Beginners would be hard pushed to beat The Complete Hitchcock (Paul Condon and Jim Sangster, Virgin Books); for those more familiar with the director we’d recommend The Art of Alfred Hitchcock (Donald Spoto, Doubleday), Hitchcock’s Films Revisited (Robin Wood, Columbia University Press, Import) and the indispensable Hitchcock (Francois Truffaut, Touchstone Books).